Coronado is conveniently situated 200 metres from Paral•lel Metro Station and 15 minutes’ from Barcelona’s famous Ramblas. It offers free Wi-Fi throughout and reception is open 24 hours a day. Rooms at Coronado feature a simple design and come with a private bathroom. They also include air conditioning and heating. Guests can enjoy drinks and snacks at the bar-cafeteria in the lobby area. There are also many bars and restaurants within a 5-minute walk of the hotel. The Magic Fountains in the Montjuic area are 15 minutes’ walk from Coronado while Barcelona’s port is 10 minutes away. 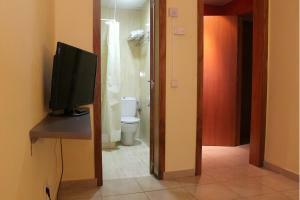 This air-conditioned room features simple design and comes with free Wi-Fi, a TV and private bathroom. 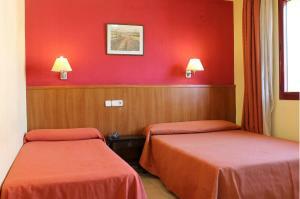 Rate: € 25.00 ... € 137.25; select dates below to get current rates. 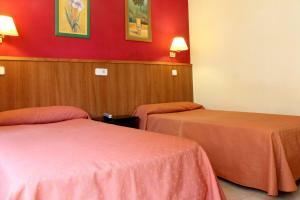 Rate: € 25.00 ... € 143.00; select dates below to get current rates. Rate: € 60.13 ... € 73.10; select dates below to get current rates.